Every year on the 14th of June, countries around the world celebrate World Blood Donor Day. 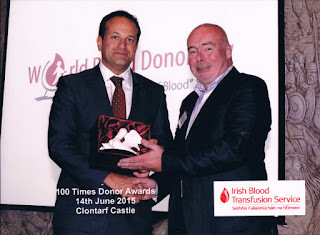 To mark the occasion in Ireland the Irish Blood Transfusion Service held a dinner in the Clontarf Castle Hotel at which people who have made 100 donations were presented with a porcelain pelican by the Minister for Health Leo Varadkar. Receiving my award from Minister Varadkar. Red faced (from heat, not drink)! I'd say there were about 100 donors present at the event, most with partners - the lovely Roma joined me. Most of the donors, like me, were there for 100 platelet donations. 100 might seem like a lot, but since each donation is counted as a double, and you can donate once a month - it doesn't take long rack up the numbers. 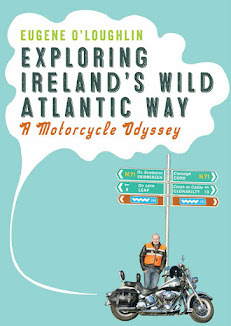 In fact it is only just over a year and a half since I reached the 50 donation mark. Sitting beside us at the table were Ken and Rita Boylan (Dad and Mum to Dublin's MEP Lynne Boylan) - a lovely couple who were great to chat to. Ken was receiving the 100 donations award for 100 whole blood donations. This is a much greater achievement than reaching the 100 mark through platelet donations. Whole blood donations can only be taken once every three months, and each one counts as a single donation. I felt like a bit of a fraud beside Ken. Only one way to feel better - get to 150 or 200! Over 3,000 blood donations are needed every week in Ireland, and over 1,000 people receive transfusions every week. Only 3% of the Irish population give blood, providing blood for a population of over 4 million people. In fact only 5% of the Irish population eligible to give blood do so (figures from Giveblood.ie). If you would like to donate, or find out more information about giving blood - visit the Irish Blood Transfusion Service website for all the details.